Published: Aug. 8, 2012 at 02:51 p.m. Updated: Aug. 8, 2012 at 11:21 p.m. 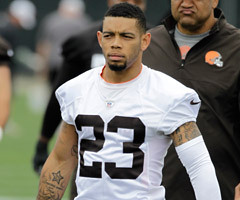 The NFL is reviewing a failed test by Browns cornerback Joe Haden for the prescription drug Adderall, which could result in a four-game suspension, Tony Grossi of ESPN Cleveland reported Wednesday, citing multiple sources. Grossi reported that Haden tested positive during a routine test administered by the NFL during the offseason. Adderall, which can be used to treat symptoms linked to attention deficit disorder and narcolepsy, is among the league's list of banned substances. The NFL declined to comment to Around the League on the matter. Browns spokesman Neal Gulkis emailed Grossi to say: "Don't know anything about that. Can't confirm." Sources told Grossi, however, that the third-year pro has been notified of the positive test. NFL policy dictates that a second test can be run from the original sample. If he is punished by the NFL, Haden can appeal the suspension, which would result in the loss of four game checks, or $1.356 million in his case. Haden arguably is the best player on a Browns defense that will start the season minus defensive tackle Phil Taylor (torn pectoral muscle) and linebacker Scott Fujita (three-game suspension). Haden declined comment to ESPN Cleveland, but he'll have a hard time escaping this story until the details become clear. Update: Pat Shurmur refused to address the report in a post-practice interview Wednesday. "Joe Haden's status is he's out here practicing getting ready to play," Shurmur said. "Beyond that I don't know anything about what was reported and if I did I wouldn't be allowed to talk about it so at this point he's out here practicing getting ready to play a game."